Best Publishing Company - DEPTH Blog - You're Exclusive Sneak Peek . . .! 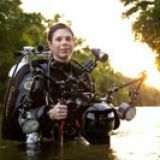 Get an exclusive sneak peek of this newly created 7-minute film by Jennifer Idol about her journey diving across all 50 states. Jennifer has not shared this video with many people outisde of her personal circle. We are so honored to be one of the first to see it and share it with you (with Jennifer's permission, of course)! This video was created for the film festival in Seattle at the Scuba & H2O Adventures Show.